Figure 1: Blockstream on Rundhø, note the car for scale. Photo: P. Marr. Wanderlust, which evolved during German Romanticism in the early 1800s, is becoming increasingly popular. Nowadays, we want to visit remote places, for example mountain areas in Scandinavia, to decelerate our accelerated lives. By pursuing this lust to literally wander around the Scandinavia wilderness you might stumble over some weirdly looking rocky landforms. Some look like river streams (Figure 1), some like sorted hexagons (Figure 2) or as an ocean of rocks (Figure 3). Now your wonderlust comes into the game, as you might wonder: How were these landscapes formed? How many people do you need to arrange the rocks like this? And finally, can these rocky landforms help us to understand how, when and during which environmental circumstances they formed? Two recent papers shed light on the importance of these landforms as a window to explore past climate changes following the last ice age and how we can to put them on a solid time scale. 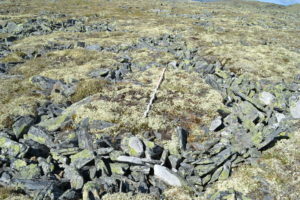 Figure 2: Sorted rock polygon, the pole is 2 m long. Photo Philipp Marr. 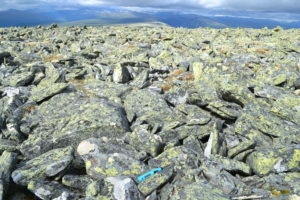 For more than a century coarse rock landforms and their occurrence on mountains in high-altitude areas have been discussed in various scientific disciplines, from glaciologists to botanists. 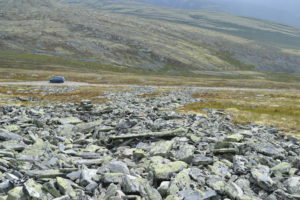 The weirdly arranged landforms, so called patterned ground (Figure 1, 2) are composed of rocks or rocky debris with little or no soil material. They mostly form by a mixture of thawing and freezing of soil. Blockfields (Figure 3) are partly considered to represent the former ice free areas and can be used to determine ice thickness. Scientists can use these landforms as a window back in time to get insights into past climates. At this point, we are facing a problem. In order to connect landscape evolution to climate, we need to assign an age to these landforms. Unfortunately, usually dating those landforms is expensive and time-consuming. But there is help: in the form of the Schmidt Hammer (Figure 3). With this tool, which is not a real hammer, we can determine rock strengths by measuring the rebound velocity of a plunger shot on a rock. Figure 3: Rundhø blockfield, the Schmidt hammer is 20 cm long. Photo Philipp Marr. When we measure rocks we expect that a young, unweathered rock is relatively strong, having a high rebound value. In contrast, older rocks are weaker as they are exposed to the surface for a longer time. They experienced more weathering such as rain and frost and therefore have a lower rebound value. The newly developed concept of Schmidt-hammer exposure-age dating (SHD) offers us the possibility to accurately date rocky landforms. By using a young and an old rock surface of known age as reference points and the assumption of negligible changes in weathering over a certain time (which works for 20000 years back in time in Scandinavia), we can calculate a calibration curve from their rebound values. Now we can go outside, look for rocky landforms, Schmidt-Hammer them (of course there are norms how to do it and other things to consider), put the rebound values of the landforms in the calibration curve and we get accurate and robust age estimations. In both mentioned papers we successfully dated several rocky landforms in southern Norway with the help of SHD. We could show that some patterned ground features and blockfields are stable at the surface since ~19000 years. It is important to know that these landforms are only forming without ice coverage. However, they need cold climate conditions to develop, that´s why we can be confident the climate was cold during their formation. In this light, our findings are surprising as the study area is supposed to be covered by ice during this particular time. This discrepancy can have important impacts on the reconstruction and prediction of climates. By putting these landforms into a time frame we can learn a lot about climate conditions during their formation thousands of years ago. This is important because we heavily rely on past climate data to feed our climate models to predict the future climate developments. SHD offers the possibility to study many rocky landforms in a cost and time effective way nearly everywhere in the world. At the end of the day, having read this post you might wander around with open eyes in mountain areas. And after satisfying your wanderlust and decelerating your life, indulge in a bit of wonderlust and consider the way the landforms around you have evolved. See more our two recent papers in The Holocene and Geografiska Annaler for more information on the palaeoclimatic significance of periglacial landforms in Norway. 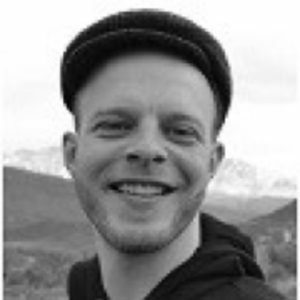 Hi, my name is Philipp and I am currently a PhD candidate at the University of Bonn in Germany. I am working on the palaeoclimatic significance of periglacial landforms and the glaciation history in Norway. Tagged Geography, geomorphology, Holocene Thermal Maximum, landform evolution, Last Glacial Maximum, Norway, periglacial landforms, Schmidt-hammer exposure-age dating.